EcoVoices is a collaborative institute of the San Gabriel River Discovery Center Authority. The Center for Urban Resilience (CURes) at Loyola Marymount University (LMU) has been a participant in EcoVoices since its inception in September 2012. This blog post was authored by Dr. Richard Shope, Director of EcoVoices and CURes Community Science Research Fellow. When I was in grade school in the late 1950s, we were imbued with the fear of nuclear holocaust. Every few weeks, in our otherwise calm elementary school, we would file out into the hallway, then crouch down placing our jacket over our faces– to protect our eyes from the atomic blast’s blinding flash. Today we fear terrorist attacks, random shootings– and global warming. We can’t do much about the fear of the Other– of those who would drop bombs, crash jetliners into tall towers, or randomly spray innocents with gunfire. Global warming, however, adds the emotional burden of it also being humanity’s own anthropogenic fault. The public discourse pits fear, shame, and denial against policy, science, and stewardship. A wind-breaker over the face in the school hallway is no more protection against a nuclear explosion, than a pledge to take shorter showers is going to solve the drought. The sheer scale of the problem is greater than any individual action. Even if all 7 billion individuals on the planet could be persuaded to act in unison, which actions would do the job? Indeed, what should we on the planet DO? In the year 2000, the United Nations Ecosystem Millennium Assessment project called on scientists worldwide to gather crucial data to inform decision-makers about the consequences of global climate change for human well-being, and by implication, for the well-being of the world. Fifteen years and many publications later, a considerable body of data has been amassed that removes any doubt that the true crisis of the 21st century is to develop keener foresight and adaptive strategies to cope with the regional impacts of global climate change. Against this global backdrop, since 2012, in concert with CURes’ Community Science program, we at the future site of the San Gabriel River Discovery Center have been quietly developing EcoVoices, a Community Science approach to Environmental Stewardship education. Using our approach, K-12 students are guided through inquiry science expeditions by science-savvy inquiry coaches. The San Gabriel River Watershed Ecosystem is the central case study. EcoVoices expeditions emulate how the science and environmental action communities work collaboratively in the real world– where the processes of scientific inquiry inform the decisions of environmental stewardship. In its first three years of weekly expeditions, EcoVoices brought over 7000 students to its site at the Whittier Narrows Nature Center, 11 resilient acres along the San Gabriel River just southwest of where the 60 and 605 meet in South El Monte. Each expedition engages students in being and becoming community scientists and environmental stewards. They experience a nature walk, a science theater performance, hands-on research activities, and the opportunity to share their discoveries with peers. They also discuss how to apply their discoveries to their everyday lives. A central feature a collaboratively funded youth work experience that teams up with the L.A. County Workforce Innovation And Opportunity Act (WIOA) program to bring together high school and college-age youth to be and become Urbanauts. Just as Astronauts venture to interplanetary space, Urbanauts venture into urban community space. Over the past three years the WATERS program (Watershed Awareness Training for Ecological Research and Stewardship) has hosted over 25 Urbanauts from Jefferson High School (South Los Angeles), El Rancho High School (Pico Rivera), South El Monte High School (South El Monte), Mountain View High School (El Monte), Montebello High School (Montebello), Valley View High School (Hacienda Heights), Workman High Schools (La Puente), and Ambassador School of Global Leadership (Downtown Los Angeles) working alongside college students from Loyola Marymount University, Cal State Los Angeles, UCLA, Rio Hondo, Citrus College, and Los Angeles Community College– all as paid inquiry coaches or community service volunteers guiding K-12 youth through EcoVoices Expeditions. 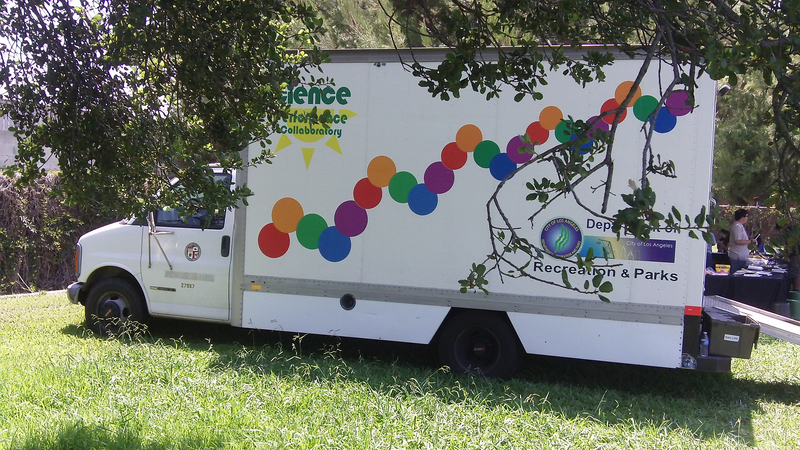 This past summer of 2015, the EcoVoices program provided traveling expeditions for over 3500 students and their families at 32 City of Los Angeles recreation centers with Summer Night Lights program as part of the Mayor’s Gang Reduction and Youth Development (GRYD) program, in collaboration with the City of Los Angeles Department of Recreation & Parks. Our team of 20-some Community Scientists arrives on site with a truck load of hands-on activities set up as a series of science performance collaboratories, creating an outdoor field expedition equipped with microscopes, binoculars, science journals, magnifying lenses, and other materials geared to foster the acquisition of science fluency through inquiry-driven exploration of themes related to the discovery and understanding of watershed ecosystem concepts. While these are true accomplishments, greeted with enthusiasm at each site, we could be doing so much more to increase awareness of Community Science and activate potential for transformative environmental action. Just as a single rainfall does not solve the drought, a single series of one-shot expeditions, dynamic as they are, is only as drop in bucket when you consider the need. Instead of ONE team, imagine if EACH of the 32 historically disadvantaged communities had a team of science-savvy youth hired from each neighborhood: do the math! 32 sites times 40 evenings of Summer Science = over 1250 events reaching over 10,000 youth. Imagine the EcoResilience that could spin out by operating at scale. For this reason, EcoVoices continues to build collaborative unity to bring inquiry science expeditions to more and more communities. How do we do this? We expand our expeditionary force of Urbanauts, working as Community Scientists and Environmental Stewards in collaborative unity with our partnering organizations– we engage college and high school youth to work throughout the LA City Recreation & Parks and the LA County Parks & Recreation systems, to mentor urban youth as Urbanauts in community service and youth workforce programs, so that by the the summer of 2016, EcoVoices can offer community science learning experiences to thousands more than ever before, seeding the knowhow within each neighborhood. Then we might better justify our pat-on-the-back-claim that we are making a true difference in raising awareness about watershed ecosystems as we face the consequences of climate change in our everyday lives. This is exactly what we are setting about to do. It’s a question of scale! About the Author: Dr. Richard Shope is a science educator who directs research, education and workforce development programs for urban youth. He is the President of the World Space Foundation; Program Development Officer at the Youth Science Center (as a Consultant with Shope Performance Group); Founding Director of Urban Science Corps; Director of EcoVoices at the San Gabriel River Discovery Center and Artistic Director of the Sci Mi Theatre. Prior to coming to CURes, Shope was the Science Communicator and Educator for NASA’s Jet Propulsion Laboratory for 15 years, where he coordinated education and outreach programs for various flight projects at NASA’s Jet Propulsion Laboratory. Through this program, he focused on reaching urban youth and rural American Indian youth nationwide. With over 40 years of experience as a poet, mime artist, and educator, Shope is known for his abilities to communicate science through narrative mime. He first encountered the art of mime in the midst of university studies in intercultural communications. Mentored by Marcel Marceau and Mamako Yoneyama, he has performed as a professional mime artist since 1971. He created Mimewrighting, a kinesthetic teaching method that has reached over a million schoolchildren, nationwide and throughout Mexico. Shope holds a B.A. degree at Antioch University Los Angeles; M.S.Ed. and Ed.D. degrees in Science Education at the University of Southern California. Research/Practitioner interests include: inquiry-driven informal science education and teaching for conceptual change. He has served on the Board of the California Association for the Gifted, the Los Angeles County Science & Engineering Fair Committee and the Governing Board of the Ambassador School of Global Leadership.